This luxurious sleigh bed is overflowing with extravagant features and appealing shapes that will give your room a European Traditional style everyone will enjoy. 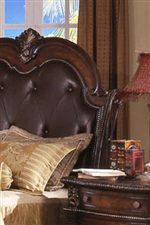 It begins with an arched headboard with bonded leather and button tufting that is surrounded by elegant beading and a beautifully crafted wood frame. 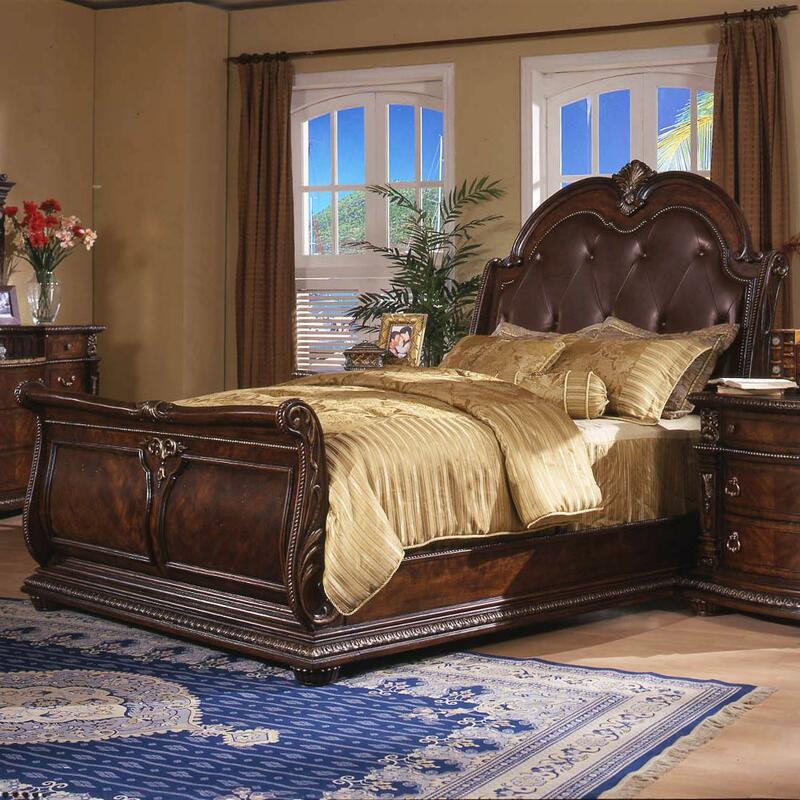 The footboard enhances this bed's style with its beading, embossing, and appealing sleigh shape. Together, this bed radiates a comfortable tone without losing its traditional nature, a sure combination to impact any decor. The Coventry Traditional King Sleigh Bed with Button Tufted Bonded Leather Headboard by Holland House at Miskelly Furniture in the Jackson, Pearl, Madison, Ridgeland, Flowood Mississippi area. Product availability may vary. Contact us for the most current availability on this product. Overflowing with European Tradition, the Coventry collection uses its massive elegance and spectacular eye appeal to transform the look of any bedroom. 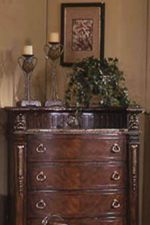 Constructed from Birch veneers and Mahogany hardwood solids, this collection features an Akzo brown cherry finish, distressed and burnished, and accented with antique, brass-finished hardware, adhering to the traditional style. Strong features including button tufted, bonded leather headboards, bowed drawer fronts, embossed detailing, laminated marble tops, and abundant shapes bring out this collection's impeccable style, sure to make it the most impressive room in your home. 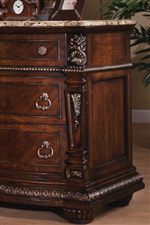 The Coventry collection is a great option if you are looking for Traditional furniture in the Jackson, Pearl, Madison, Ridgeland, Flowood Mississippi area. 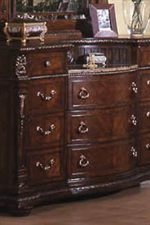 Browse other items in the Coventry collection from Miskelly Furniture in the Jackson, Pearl, Madison, Ridgeland, Flowood Mississippi area.